It’s been a slightly crazy week in terms of where my mind has been. After a weekend of finishing the novel The Anubis Gates by Tim Powers and watching some random television, I started Monday with every intention of delving back into City of Orphans and generating some serious word count. I go to the Consortium office on Monday to focus away from my children, have a meeting with my co-workers, and plot out (in my mind at least) the direction I want my week of work to go. I had written about three hundred words on my novel when I was talking to Aaron and expressing my (very valid) fear that no one would care to read City of Orphans once it is actually written. This led to me vocalizing two thoughts, one that I had been thinking for a long time, and one that randomly popped out at the mooment. was that I wanted to write a series of short stories and then publish them together in one novella. The stories were already plotted, and I’ve been working on them off and on for a few months, but always put them on the back burner in favor of my novel-length pursuits. 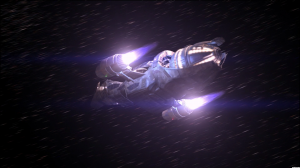 The series is set on a spaceship, which is nothing like a firefly except that I looked up how a firefly flies in space to decide how I wanted my spaceship to fly. Hence the picture of Serenity there. Aaron encouraged me to go for it. He wasn’t saying that I had to do it, but his positive response was enough to make me drop City of Orphans in the dust–for now. I spend all of Monday adding three thousand words to the short story “The Infirmary.” I finished it Tuesday morning and, after reading through it a couple more times to make sure it wasn’t complete rubbish, sent it to Aaron. Then I sent it to my sister, because she is always good at boosting my self-esteem, and she gives faster feedback than Aaron. By the end of Tuesday, and with Mara’s feedback under my belt, I started tackling the next in the series of shorts, this one entitled “The Planet.” As of this Thursday morning, I am eight hundred words into “The Planet” and am pretty sure how it’s going to end. I mean, I know how it’s going to end, but usually I like to write out the last few sentences in my short stories first so I know what I’m writing toward. Otherwise I might lose sight of the point and start rambling, which is never a good idea in a short story. was that, rather than trying to write a novel that is well written and full of plot and characters, I should just give the masses of readers what they really want and write about vampires. It was half spoken in jest over the success of 50 Shades of Gray and half spoken in fear/frustration that City of Orphans won’t be high quality literature anyway. Nonetheless, the thought would probably have been dismissed if it weren’t for the fact that I’m rewatching Being Human just now. Being Human is a British televisiton show about vampires, werewolves, and ghosts, and so far the only show about these things that I haven’t stopped watching halfway through the pilot episode because it felt like I was watching a soapy teen drama. There’s so many small things that I love about this show and it makes me feel dumb for liking something with vampires in it, but that’s because these are not like the Buffy or Stephenie Meyer vampires that we’ve become accostumed to seeing lately. Anyway, because I’m watching this show and my heart is being torn out by Mitchell (the main vampire) as he gives in to his darker nature, I keep thinking, “I want to do something like this.” I know that I can never do it justice, and it will turn out cliche and all that, maybe someday I’ll actually try to write a vampire novel. It would be, if nothing else, a new experience, and Aaron says that’s a good thing. So as of this morning I have a vampire character in my head, ready to go if I ever feel the need. He is going to kill a priest. But then, what else is new? P.S. If you’re going to watch Being Human (it’s on Netflix), don’t watch the American re-imaging of it. I mean, it’ll do in a pinch, if you really need a vampire fix, but it removed everything I loved about the original show. Also, if I were a vampire named Jude, I would totally go kill a priest. I highly approve of this new venture and can’t wait to read it!